How do you stop the hottest team in the CPBL that is currently on a 10-game win streak? Well, for the Chinatrust Brothers’ Elih Villanueva, throwing a 10 strikeouts no-hitter is one way to go about it. 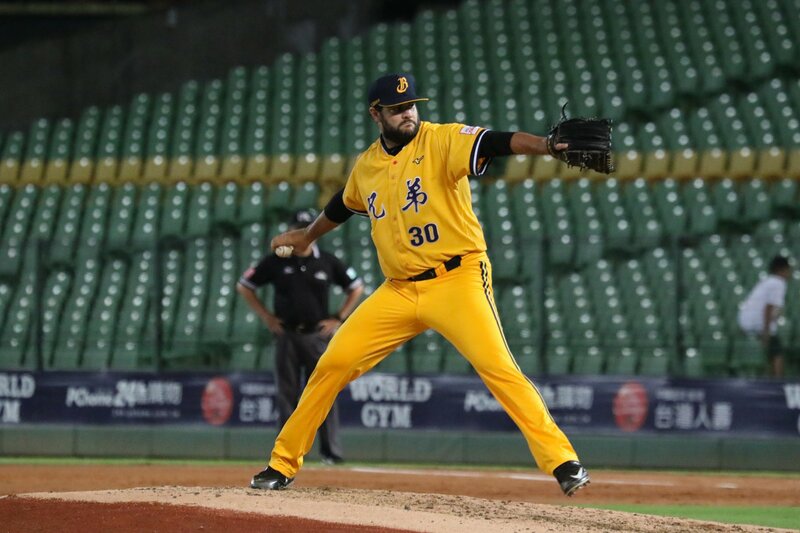 The Brothers’ RHP threw a total of 114 pitches and went full nine innings with no hits and only issued two walks to becomes the ninth pitcher to throw a no-hitter in the CPBL. Villanueva’s opponent, Zeke Spruill who has not lost a game in the 2018 season also had a quality start. The Monkeys’ RHP tossed six innings only allowed three hits and one earned run. Despite the fact, Spruill struck out five Brothers hitters, what end up hurting him was the five walks he issued (three of them to the Brothers’ “God of Walks” Chou Szu-Chi). The no-no is also the second no-hitter games this season. Coincidentally it is by Villanueva’s teammates Nick Additon on June 9, 2018. This is also the first time in the CPBL history with multiple no-hitter games in a single season. Prior tonight’s game, Villanueva has a record of 5.20 ERA and 1.78 WHIP. With this no-hitter, he has lower his 2018 CPBL season record to a 4.36 ERA, and 1.51 WHIP over nine starts. This was his fourth quality start since his CPBL debut back on July 27. Furthermore, Villanueva only gave up two earned runs in his last three starts. Beside of Villanueva’s outstanding changeup, the splendid Brothers’ defence was also another major contributor to the no-hitter. Villanueva was at risk of losing his no-no in the top of the seventh when Monkeys’ Yang Yao-Hsun connects for a line drive down the middle. However, the ball was snagged by the Brothers’ veteran shortstop 王勝偉 (Wang Seng-Wei) with a fully extended diving catch. The odds are now good that the Brothers will bring Villanueva back in 2019. Do the nine CPBL no-hitters include Pat Misch’s no-no in the Taiwan Series? It’s really hard to say, Villanueva is not that good this season. However his last three games were solid though. That change-up and slurve of his were quite effective in the last few games. I guess they will keep watching until the end of season. He will probably have another one or two starts. If Villanueva is able to keep his momentum then yes very likely to return in 2019. I think we will probably see Additon, Lively return for 2019, Villanueva will get an invite and another foreign player (Bennett Parry or someone from the Mexican League) fight for the last spot in the first team. Yep, the nine no-hitter include Pat Misch’s one. Villanueva got bombed today, so his chances don’t look as good as they did last week. Maybe the Brothers will bring him back as their 4th foreigner in 2019 for $10,000 to $12,000 a month? That’s better than he’d get anywhere else.